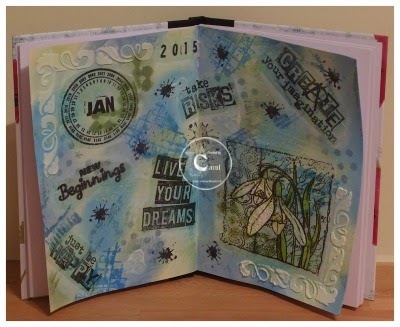 We have today a tutorial from Shilpa to share with you! Stamp Decoupage Hanging basket on white card with Ranger jet black Archival ink. Colour the image with watercolour pencils- (pink and lavender) and water brush pen. On vintage design paper apply modelling paste with stencil at one of the corner. Let it dry completely. Spritz inks with pink and Lavender colours. Let it dry in between the colour layers. 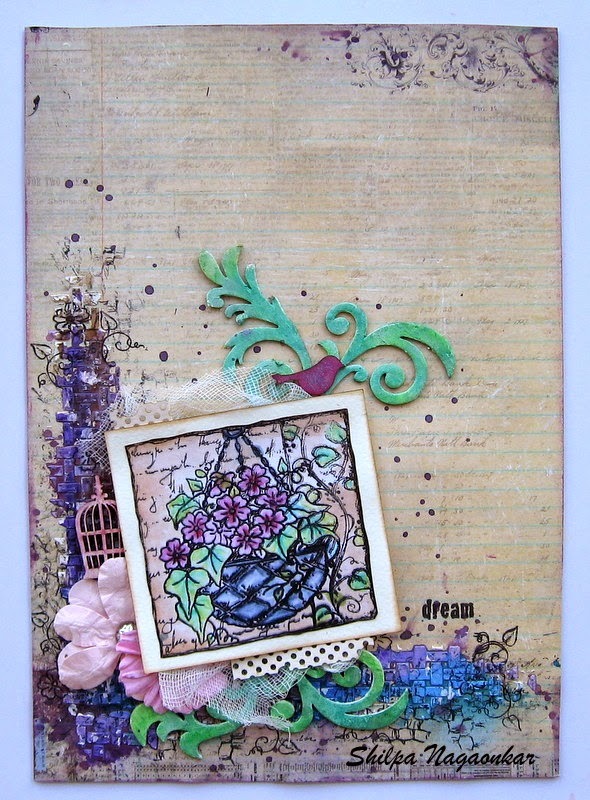 I've used flowers and swirls from same Imagination Crafts decoupage stamp set in the background. Create layers with flowers, flourishes, cheese cloth, chipboard piece. Add tiny wooden birdcage and bird. apply pink Gelatos at all edges of base paper. Isn't this just wonderful, I will definitely be having a go at this. Happy Monday to your all! 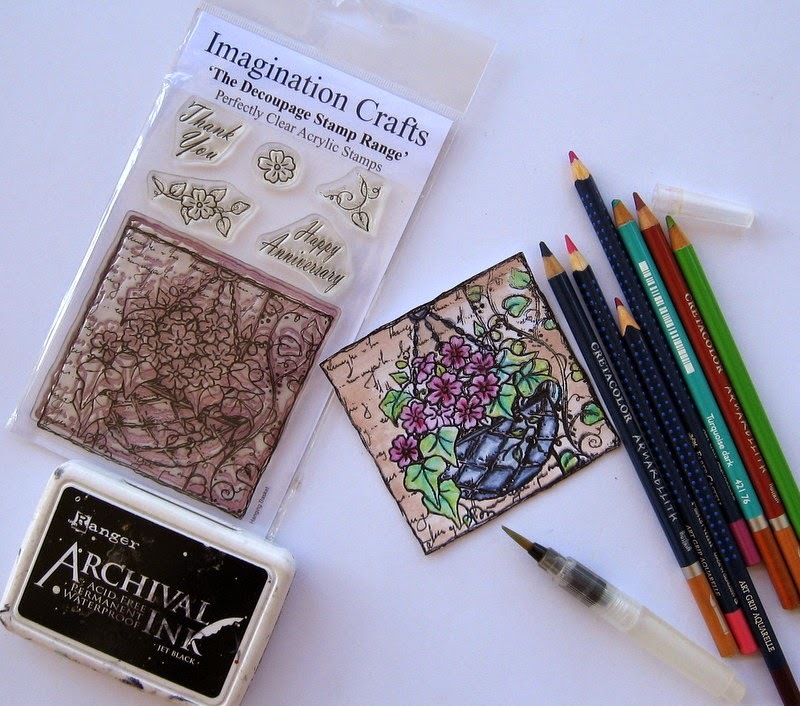 Today we have a tutorial to share with you from Carol. Stamp image on tissue paper with Memento ink. Colour on the front with Promarkers. To ensure snowdrops show white paint on the reverse with white acrylic paint. 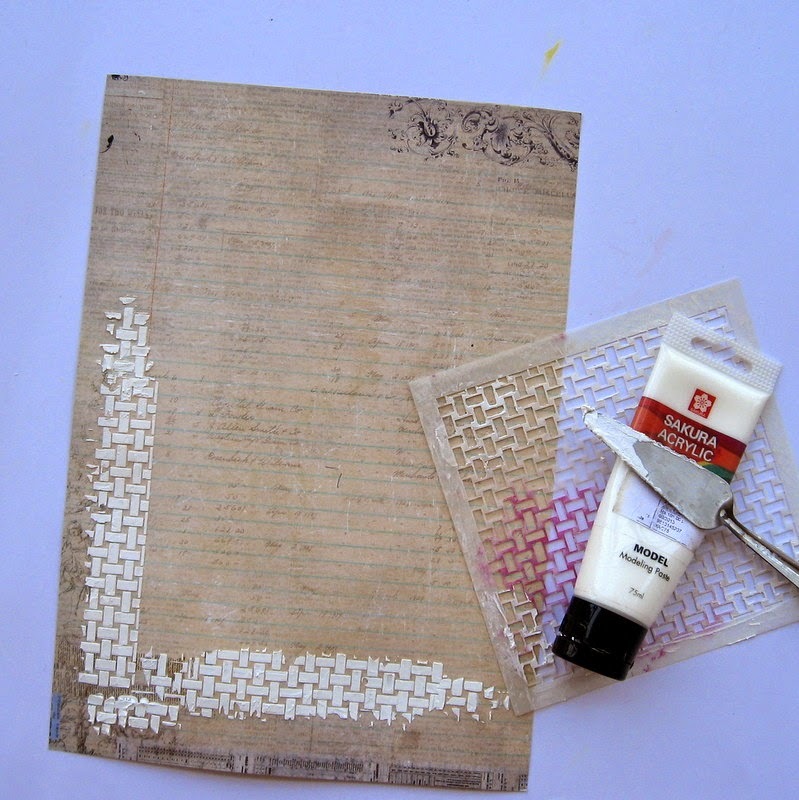 (attach a small piece of tissue to an A4 sheet of copy paper with stencil tape and run through the printer as normal. 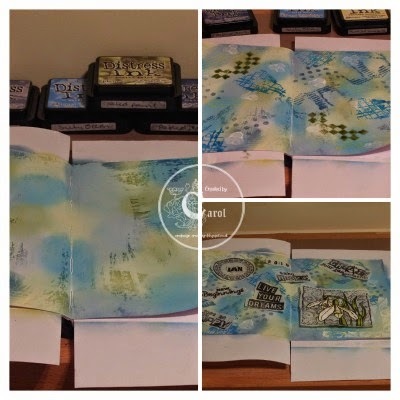 Journal pages have been roughly painted with white acrylic, then once dry inked up with various distress inks. 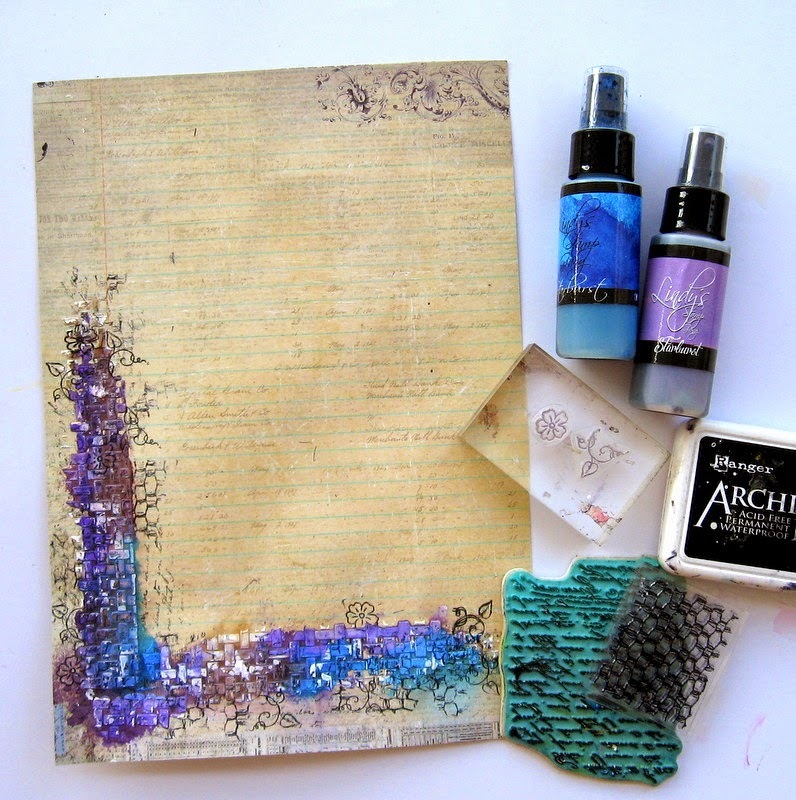 Using the same distress inks to stamp various stamps over the background. Stencil and texture paste used in two corners and everything left to dry thoroughly overnight. 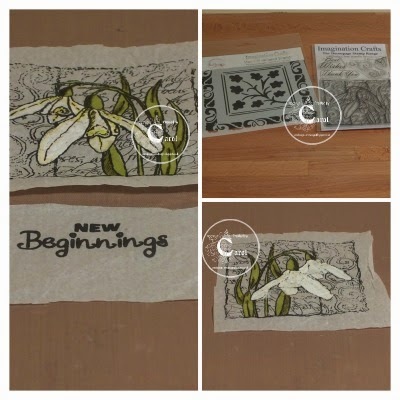 Various sentiment stamps and date stamp were stamped onto tissue with Archival ink. Image and sentiments were placed on the journal then attached with gel medium. Splats were stamped in black Archival ink and using a toothbrush to splatter some white distress paint. I love these pages and I hope it has inspired you all. We would like to welcome all our new followers to the blog. tutorials created for you by our design team. 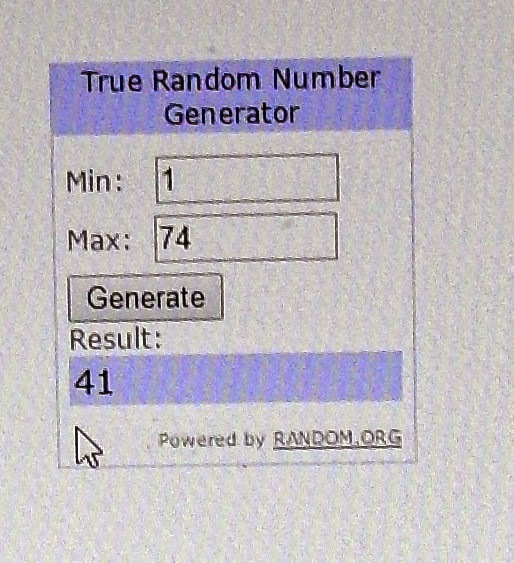 Congratulations Gwen, please contact me (Linda) with your address so I can send your prize to you. Once again thank you so much everyone for your continued support.